If you shoot, collect or have any interest in ComBloc firearms, then you should be aware of the Wolf brand. Their economical ammunition makes the world go around. One name that has become almost synonymous with economical steel-cased ammunition is Wolf Performance Ammunition. If you shoot, collect or have any interest in ComBloc firearms, then you are likely well aware of the Wolf brand. Their 7.62x39mm, 5.45x39mm, 9x18mm and 7.62x54mmR loads are a staple of shooters across the country. While Wolf Performance Ammunition is best known for their economical steel-cased ammunition, the company is neither Russian nor limited to this type of product. They also offer high quality brass-cased ammunition, match grade .22 rimfire, shotshells, day optics, Gen 3 night vision devices, piston and direct gas AR upper receivers, reloading components and rifle cases. Even though Wolf Performance Ammunition offers such a diverse line of products, shooters know them best for their ComBloc caliber ammunition. While Wolf has greatly diversified beyond ammunition, economical new-production steel-cased ammunition remains a cornerstone of their business. Wolf Performance Ammunition is actually the brand name used by an American company called Sporting Supplies International, Inc. (hereafter referred to simply as Wolf). Founded in Anaheim, Calif., in 1996, they began by importing new production sporting ammunition in popular ComBloc military calibers from Russia. Looking back, this was only a few years after the fall of Communism. With Russia suddenly open to the West, many companies and individuals headed east to make some quick money. What set Wolf apart from this "get rich quick" crowd was the desire to build long term relationships with its partners. This approach was quite different than most, who simply wanted the cheapest ammo they could find from whoever would sell it to them. To make the ammunition line distinctive Wolf created the Wolf Performance Ammunition brand. Attractively boxed, it stood out from the drab Stalin-era boxes of other importers. Wolf also stood out from the crowd by the manner in which they stand behind their product. They offer a money-back guarantee on their ammunition. If you are not happy with the performance of the ammunition, Wolf will refund your money for the unused portion, including shipping charges. No questions asked. Within a relatively short time, Wolf Performance Ammunition became hugely successful and a major player on the U.S. ammunition market. It soon expanded from selling only traditional ComBloc calibers and began offering American favorites like .223 Rem, .308 Win, .30-'06, 9mm Parabellum, .40 S&W and .45 ACP. All of this was new production ammunition and priced so the average blue collar worker could afford a fair bit of recreational shooting, plinking and practice with family and friends. One of the hallmarks of Wolf's steel-case line, after all, is a price that lets shooters spend more time at the range. How well does Wolf Performance Ammunition actually perform? To demonstrate, I gathered together four popular loads I thought would be of the most interest to readers. I selected three loads from Wolf's popular Polyformance line and one from their Military Classic line. From the Polyformance line I selected the 5.45x39mm 60-grain FMJ-BT, 7.62x39mm 125-grain soft-point and 9x18mm 94-grain FMJ. 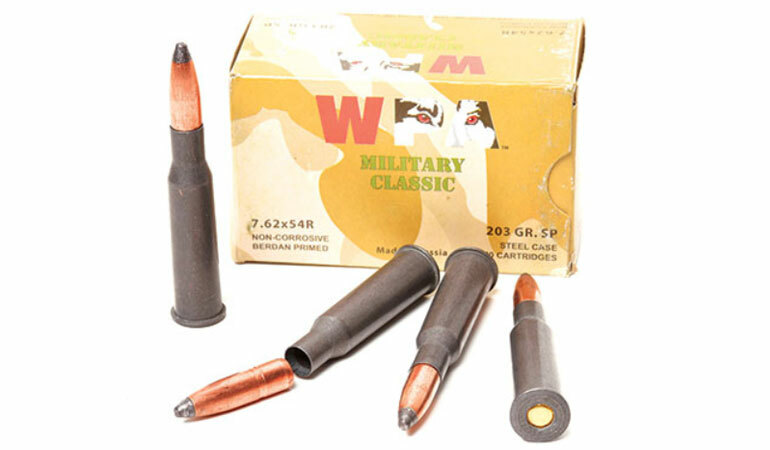 From the Military Classic line, I selected the popular 7.62x54mmR 203-grain soft-point. Each one of these loads was then examined, examples were broken down and components measured, velocity was checked using a LabRadar Doppler Radar chronograph and accuracy was measured. Rifle cartridges were tested at 100 yards while the lone pistol load was tested at 25 yards. We chose four loads to test from Wolf Performance Ammunition: 9x18mm 94-grain FMJ, 5.45x39mm 60-grain FMJ, 7.62x39mm 125-grain SP and 7.62x54mmR 203-grain SP. Wolf's 9x18mm 94-grain FMJ load proved both accurate and soft shooting through a Bulgarian PM Makarov pistol. With steel cased ammo, shooting it is inexpensive. Forever linked to the pistolet Makarov (PM) it was adopted with in 1951, the 9x18mm cartridge sits midway between the .380 ACP and 9mm Parabellum in size. Performance-wise the 9x18mm cartridge is closer to the .380 ACP than the Parabellum. Adopted to replace the Soviet 1930s-vintage 7.62x25mm cartridge, the 9x18mm is a very different design. While the 7.62x25mm M1930 cartridge features a bottleneck cartridge case and smallbore .30 cal. projectile that runs at high velocity, the 9x18mm uses a short straight-wall case with a moderate diameter projectile pushed to moderate velocity. The pistol/cartridge combination was intended to be accurate, easy to shoot with mild recoil and report. 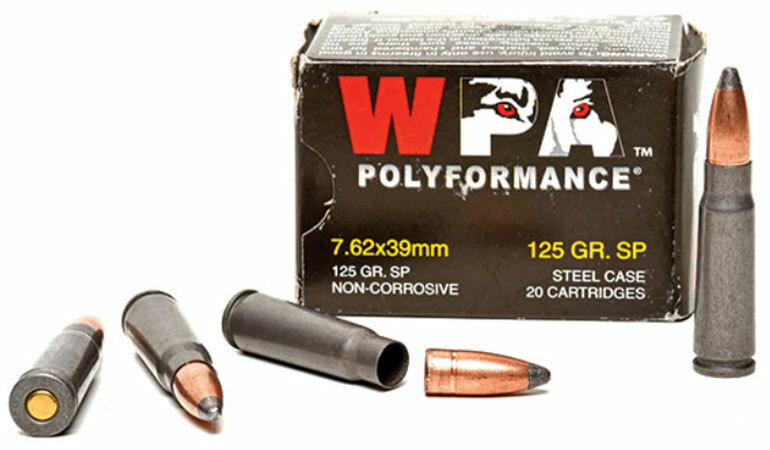 Terminal performance was intended to be similar to 9mm Parabellum FMJ ammunition. The pistol is compact and easy to carry and served Russian troops for more than 50 years. Wolf's load features a 94-grain round nose bullet with a flat base. The projectile is .362" in diameter and features a bimetallic jacket and lead core. The projectile is loaded into a steel cartridge case. This features a non-corrosive Berdan primer and a charge of ball type smokeless powder. The case features Wolf's popular gray polymer protective coating. It comes packed in 50-round boxes with plastic trays. I began with a visual examination of 250 rounds. This revealed zero problems or cosmetic issues. Primers and projectiles were uniformly seated. The projectiles do attract a magnet. For testing, I selected a Circle 10-marked Bulgarian PM Makarov pistol. Four five-shot groups were fired from a sandbagged rest at 25 yards. While the Makarov is proportioned more like a pocket pistol, I chose to test it at a full 25 yards. Accuracy proved quite good, which is a trait of this design. Four 5-shot groups averaged a respectable 2.5 inches. Next I fired a 10-shot group at 25 yards that measured 4.2 inches. Velocity averaged 1037 fps. Running this load through a variety of drills from 5 to 15 yards revealed it to have mild recoil, allowing fast follow-up shots. Extending the range, I was able to score 80% hits firing offhand at a ShootSteel.com silhouette at 100 yards. Overall, I was very pleased with this load's performance. It proved accurate and reliable with zero issues encountered. 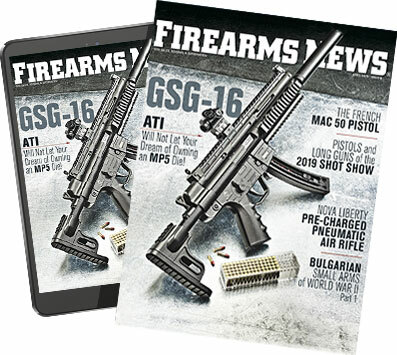 While surplus 7N6 ammo is gone, Wolf still imports this steel-cased 60-grain FMJ 5.45x39mm load so AK-74 shooters can get their fix at a good price. Adopted by the Soviets in 1974 as a replacement for the 7.62x39mm M43, the 5.45x39mm has never achieved the popularity of the cartridge it replaced. Introduced with the AK74, the 5.45x39mm M74 has proven to be an excellent rifle cartridge. It features a tapered case with a thicker rim than the 5.56x45mm NATO, both of which aid reliability. Its case design makes it very well suited for use in automatic weapons. Accuracy is typically quite good, and a noticeable improvement over your run of the mill 7.62x39mm rifle. Trajectory is flat and our testing using Doppler radar has shown the military issue 52-grain 7N6 ball round to have a relatively high ballistic coefficient of .352 G1 and .190 G7. Recoil is very mild. The Russian military 7N6 ball round has a steel penetrator core and an air space in the nose. This load is known for its rapid yaw cycle in soft tissue. Wolf Performance Ammunition's commercial load features a 60-grain FMJ bullet with a boattail. The projectile is .221" in diameter and features a bimetallic jacket and lead core. Sectioning a projectile reveals a noticeable air pocket in the nose of the jacket, similar to the 7N6. The projectile is loaded into a steel cartridge case. This features a non-corrosive Berdan primer and a charge of ball type smokeless powder. The case features Wolf's popular gray polymer protective coating. Inside each 30-round box is a typical Russian paper packet with each layer of cartridges separated by a piece of paper. I began with a visual examination of 250 rounds. This revealed zero problems or cosmetic issues. Primers and projectiles were uniformly seated. Be aware the projectiles do attract a magnet. For testing I selected a 1997-dated Intrac Mk II 5.45x39mm AK74 rifle manufactured in Romania. This was topped with a IOR Valdada 4x24mm M2 scope mounted using an old K-VAR side-mount. I've had this rifle since it was brand new and know it is capable of very good accuracy at distance. Accuracy testing was conducted from a rest using a rear bag at 100 yards. My best 5-shot group measured just 1.8 inches, while all four averaged a respectable 2.5 inches. Like I said, this particular rifle shoots well. Average velocity for 10-shots was 2760 fps with a SD of 22.9. This was just a bit lower than I would prefer. Extending the range, this load averaged 7 inches at 300 yards. Moving from the bench, I switched from paper to shooting on steel. Firing prone off the magazine I engaged my 500-yard LaRue. This silhouette measures just 11 inches wide by 20 inches tall and is noticeably smaller than a full-sized silhouette. Despite a 20 mph wind with gusts up to 25, I was able to achieve a 66% hit ratio at 500 yards. The wind wasn't full value and I was holding between 1 and 2 mils of correction. Misses were just off the left edge of the plate. I was pleased with how consistently this load performed even at this extended distance, especially considering the Kansas wind. This load fed, fired, extracted and ejected flawlessly with zero problems encountered. This is my "go-to" load in 5.45x39mm. The world's most popular intermediate cartridge, the 7.62x39mm dates from World War II. Developed as an answer to Nazi Germany's 7.92x33mm Kurz, the 7.62x39mm filled the gap between the 7.62x25mm in submachine guns and the 7.62x54mmR in rifles. It quickly replaced the old Imperial 7.62x54mmR in Soviet infantry rifles during the postwar years. Firing a fairly light 123-grain .310" projectile at a moderate velocity of 2330 fps, the 7.62x39mm was well suited for ranges out to 400 meters. Adopted by the Soviet Union, the Warsaw Pact, China and many countries in Asia, Africa and the Middle East it can be encountered around the world. While not noted for its accuracy, it has respectable barrier penetration capabilities and terminal performance when loaded with modern expanding bullets. Our testing with Doppler radar shows the original military M43 load to have a G1 BC of .295 and a G7 of 156. Subsonic loads do exist and mimic the performance of the 300 Blackout. Wolf Performance Ammunition's 125-grain Soft Point is a traditional expanding load with excellent performance. It is loaded with a 125-grain soft-point bullet with a flat base. The projectile is .310" in diameter and features a bimetallic jacket with cannelure and lead core. The projectile was designed for hunting medium size game like whitetail deer. The projectile is loaded into a steel cartridge case with a non-corrosive Berdan primer and a charge of extruded type smokeless powder. The case features Wolf's popular gray polymer protective coating. Inside each 20-round box is the familiar paper packet with each layer of cartridges separated by a piece of paper. I began with a visual examination of 250 rounds. This revealed zero problems or cosmetic issues. Primers and projectiles were uniformly seated. Be aware the projectiles do attract a magnet. For testing I selected a Century Arms produced vz. 2008 rifle. This was fitted with a Precision Reflex, Inc. mount and a red dot sight. Accuracy testing was conducted from a rest using a rear bag at 100 yards. My best 5-shot group measured just 2.7 inches, while all four averaged a respectable 3 inches. I fired one 10-shot group and put nine shots into 2.8 inches and all 10 into 3.7 inches. Average velocity for 10-shots was 2391 fps with a SD of 20.4. Firing prone off the magazine, this load went 10 for 10 on a man-size silhouette at 300 yards. While this load is made to expand, I was curious as to how well it would actually perform. So we tested it in properly calibrated 10% ballistic gelatin (per FBI protocol) at Black Hills Ammunition's ballistic laboratory. Test rifle was an AK47 and the distance to the block was 12 feet. Recorded muzzle velocity of the test shot was 2379 fps. On impact the soft-point bullet began expanding immediately, as seen by the neck in the block measuring less than 1 inch in depth. The temporary cavity measured 11.5 inches by 7.25 inches. The bullet penetrated to a depth of 16.25 inches. It had a retained weight of 106.8 grains (85%). It had an average expanded diameter of .656" with the widest portion measuring an impressive .694". This is ideal performance for personal protection or hunting medium size game. Wolf's 125-grain Soft Point is an excellent choice for anyone looking for an expanding 7.62x39mm load. It is accurate, expands reliably and penetrates within FBI requirements. Not only that, but it is inexpensive allowing it to be used for practice and recreation just like FMJs. This load has really impressed me and has become my favorite 7.62x39mm load. Why buy FMJ's when for a few dollars more per case of 1,000 you can have an impressive performing soft-point load? The only downside to this load is it may be hard to find locally so you might have to order it online. An excellent option for hunting medium and large game is Wolf's 7.62x54mmR 203-grain SP. It provides both reliable expansion and deep penetration. The 7.62x54mm Rimmed is an old warhorse that refuses to be put out to pasture. Dating from 1891, it has outlived both the Imperial Russian and Soviet empires. Adopted just three years after the French 8x50mmR Lebel introduced the world to smokeless powder, it remains in frontline service to this day. With the exception of the archaic rim, the 54mm cartridge case is well suited for use in autoloading firearms. It is slightly tapered, has a long neck and is capable of very good accuracy when properly loaded. Various bullet weights and types have been loaded down the decades for use in rifles, various types of machine guns and sniper rifles. Today the standard Russian ball load drives a 148-grain FMJ-BT with a steel core at approximately 2830 fps. While soldiering on in its 126th year of service, there is no retirement in sight for the old "54R". Wolf Performance Ammunition offers a number of loads in this caliber. These range from 148-grain FMJs to brass cased 200-grain FMJ-BT EXTRA Match ammunition. One I thought would be of interest to readers is Wolf's Military Classic 203-grain soft-point load. Intended for hunting medium and large game, this load is capable of taking down any game animal in North America. It is loaded with a 203-grain soft-point bullet with a flat base. The projectile is .310" in diameter and features a bimetallic jacket with cannelure and lead core. The nose of the projectile features plenty of exposed lead to facilitate rapid expansion, while the sectional density is good for penetration. The projectile is loaded into a steel cartridge case with a non-corrosive Berdan primer and a charge of extruded type smokeless powder. The case features Wolf's popular gray polymer protective coating. Inside each 20-round box is a paper packet with each layer of cartridges separated by a piece of paper. Following a visual examination of 250 cartridges I fired three 10-shot groups from a rest at 100 yards, using a Mosin-Nagant rifle fitted with a Teludyne Tech StraightJacket and stock. Average group size was just 1.5 inches. Muzzle velocity from a standard length M1891/30 PU sniper averaged 2,363 fps with a SD of 17.2 for a 10-shot string. At 500 yards the Teludyne Tech-modified Mosin proved capable of keeping all its shots on an 11x20 inch Larue using this Wolf SP load. At 600 yards, firing prone off a bipod, I put 36 out of 40 rounds of Wolf's 203-grain SP load onto a LaRue. So accuracy of this load proved quite acceptable. Recoil when fired from a standard M1891/30 with its steel buttplate is noticeable, especially from the bench. This would be an excellent choice for medium-size game and would be dandy on moose. No this load isn't lightning fast, but the British proved long ago that a heavy bullet driven at about 2400 fps does the job nicely on most game animals. How reliable is Wolf Performance Ammunition? While I experienced zero issues testing these four loads I wanted to push things a bit further. So I fired 5,000 rounds of Wolf's steel case 7.62x39mm Polyformance 123-grain HP load. I experienced two failures to feed that were magazine related. I followed this up by firing 5,000 rounds of Wolf's brass-cased .223 Rem. 55-grain FMJ from their Gold line with zero issues. In total, more than 10,000 rounds were fired during testing, with only two failures to feed, which were not ammunition-related. Today Wolf is importing huge quantities of new production commercial ammunition to the United States. Inexpensively priced, this steel-cased ammunition is excellent for economical practice, training, recreational shooting and plinking. It is also well suited for long term storage. With the prices low due to the current political climate, now is the time to "buy it cheap and stack it deep." I would not be able to shoot nearly as much as I do if it were not for the low prices of Wolf ammunition.